Home / Archive by category "Pandas in China"
Happy 11th Birthday to Tai Shan During Suzanne Braden’s visit to China from July 5th-13th, 2016, Pandas International hosted a special birthday party to celebrate Tai Shan’s 11th birthday on July 9th. Thanks to those of you who donated, special ice cakes were prepared for Tai Shan and the other pandas living at the Dujiangyan Panda Base so that they could celebrate their birthdays as well (future blog post). The ice cakes were decorated with apples, bamboo and carrots and Tai and his panda friends all thoroughly enjoyed them. The cakes not only served to help the pandas stay cool but also as a form of enrichment since the special treats were frozen into the ice cakes. It was interesting to see how each panda approached getting to his or her treats. Tai, of course, is a pro at getting through whatever challenge stands between him and his treats! His keeper also gave him special birthday bamboo shoots and chunks of apples during the day as well. Tai was a very happy panda! Suzanne presented Tai and his keeper with a special PI birthday card that included the names of each person that donated towards the ice cakes. Tai’s keeper was so proud of him and so grateful to everyone that loves Tai so much. Tai Shan is in good shape these days, healthy and happy and ever the very picky bamboo eater. His keeper continues to give him stalks and leaves until he finds what he likes. He has a good appetite but still prefers apples over bamboo and panda bread! Researchers at the China Conservation and Research Center for the Giant Panda (CCRCGP) say they have decoded 13 vocalizations for pandas, including noises expressed during courting. 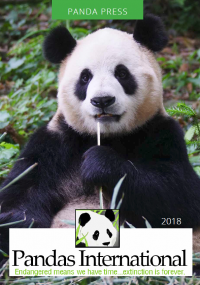 The researchers from CCRCGP, led by Zhang Hemin, the head of the center, have found that male pandas are said to baa like sheep if they are courting a mate, while females chirp if they are interested. The noises are among a range of barks, roars and squeaks that have been analysed by Chinese doctors who are desperate to boost the numbers of an animal that is one of the most endangered in the world. "Our researchers were so confused when we began the project that they wondered if they were studying a panda, a bird, a dog, or a sheep,” said Mr. Zhang. He goes on to explain, “If we can understand their language, it will help us protect the animal, especially in the wild.” CCRCGP has been working on the panda linguistics project since 2010 when they started making recordings of pandas in the center - both cubs and adults - in various situations: eating, mating, nursing, fighting, etc. They then began analyzing the voiceprints. Sounds expressed by panda cubs, they found, were basic and include ‘gee-gee’ (‘I’m hungry’), ‘wow-wow’ (not happy) and 'coo-coo' (nice). Panda mothers have a variety of calls. "If a panda mother keeps tweeting like a bird, she may be anxious about her babies. She barks loudly when a stranger comes near." While the findings of the research were met with skepticism by some on China’s social media websites, the researchers are confident in their work. “How is this panda’s consciously expressing their affections for each other,” one said. “This is basically just the sound of mating.” The center aims to set up a “panda translator” that would use voice-recognition technology”, the news agency added, without providing details. Originally reported from Xinhua News Agency. Love was in the air this breeding season for Thailand's returned sweetheart, Lin Ping. Spring is the season of love for Giant Pandas. The pandas are enjoying the spring sunshine and CCRCGP is in full breeding mode - monitoring the females, setting up "liasons", and performing artificial inseminations when deemed necessary. Unlike last year when her behavior during breeding season stayed consistent with no signs of estrous, this year Lin Ping's behavior seemed a little "abnormal" - she exhibited all of the signs of being ready to mate. On the evening of March 30, Wu Gang was presented as a potential "love connection" to Lin Ping. You might say it was love at first sight for the healthy male. He pursued her fiercely, but being her first mating encounter, Lin Ping was cautious. Their first attempts to mate the morning of the 31st were unsuccessful (Wu Gang is new at this mating thing too). Wu Gang was persistent, however, and the couple eventually successfully completed the first natural mating. Given that female pandas are only fertile for about 48 hours, CCRCGP took advantage of Lin Ping's cycle and introduced a second male, Bai Yang, to the enclosure. The two hit it off immediately and mated successfully four times. However, during one of her mating encounters with Bai Yang, he got a little bit aggressive, as pandas often do in the wild and captivity when mating, and bit Lin Ping on the shoulder. Keepers immediately treated her and shaved the wound around the bite to prevent any infection. She is doing very well. This incident reminds us that Giant Pandas are indeed bears and even in captivity they will display their innate wild behavior. To ensure that Lin Ping successfully participated this breeding season, CCRCGP staff also performed an artificial insemination. Our fingers are crossed that this beauty becomes a mother this year. The results of the fourth National Panda Census conducted by China's State Forestry Administration have just been released. According to the Administration, as of the end of 2013, the wild panda population has reached 1,864 - an increase of 16.8% over the 2003 census numbers. Wild panda habitat was measured at 2.58 million hectares, an 11.8% increase. China began surveying its giant panda populations in the 1970s. The latest census began in 2011 and took a painstaking three years to complete. The survey showed that nearly three quarters of the wild pandas live in the southwestern province of Sichuan. The remaining pandas were found in the neighboring Shaanxi and Gansu provinces. The increase in the population can be attributed largely to conservation efforts put in place by the Chinese government to protect the bear and its habitat. The administration said China has set up 27 new preservation areas for giant pandas, contributing to the growth in their numbers. Economic development still remains a threat to the rare animal and its habitat, however. The survey has found 319 hydropower stations and 1,339 kilometers (832 miles) of roads in the giant panda's habitat. In addition to wild pandas, the number of giant pandas in captivity grew by 211, more than double the previous survey figure. Together, wild and captive, there are now just over 2,200 pandas in the world. Today marks a very special day in the Panda world, the world’s only surviving giant panda triplets, Ju Xiao's miracle babies, celebrated their 100-day birthday. The trio were born on July 29 at Chimelong Safari Park in Guangzhou, capital of south China's Guangdong Province. The triplets, two boys and a girl, each weigh more than 11 pounds, up from just over 3.5 ounces at birth. They started teething at around 80 days old and have two small teeth each. The cubs alternate time with mom as she is unable to care for all of them at once. The cubs are "swapped" on a weekly basis so that each can bond with mom and get the benefits of mother’s milk and mother’s nurturing care, a procedure developed by CCRCGP’s very own Dr. Li Desheng. CCRCGP sent the Head Nursery Keeper Mr. Wei Ming to help care for the triplets, from the Bifengxia Panda Base. He says of the triplets, “The first-born appears to be a very gentle girl. The elder brother is a naughty and energetic boy with a slim figure, while the younger brother is a quite big boy.” The cubs in the nursery get a special panda formula which Wei Ming brought from the Bifengxia Panda Base. The formula was provided by Pandas International. At 100 days, Chimelong general manager Dong Guixin says physical exams show the cubs’ health to be ideal. Starting Wednesday, the cubs will be displayed to visitors for limited times. They have not yet been officially named but will be soon, according to the zoo.